Get to know your way around the App Dashboard as well as a get a brief overview on how BuildFire can help you build a successful mobile app. Hey there and welcome to BuildFire, the world’s leading app development platform powering over 10,000 mobile apps for thousands of small businesses and Fortune 500 companies. To help you get started, we’ve created some articles that will take you through the fundamentals of everything you need to know. These articles go through everything from how to build your app, to how to publish it, to how to keep your audience engaged once it’s live. If you go through all of the articles in this series we guarantee by the end of it, you’ll be a pro! What sets BuildFire apart from the competition is our robust yet easy-to-use app building platform that allows you to build a polished mobile app in a matter of hours, yet still have the ability to build powerful custom functionality for your app if you need it. That means you’re never going to be boxed in and limited with your functionality. Whether your app is simple or complex, with BuildFire’s platform you can grow and scale your app quickly and easily no matter what your needs are. Think of it this way: we’ve built our platform to cover the majority of the features your app already needs from day one. For example, you’ll need features such as Push Notifications, User Login, Media-Centric Features, and cross platform support for both iOS and Android. These are all fundamental features that are already built into the system. Now you might be thinking, “But wait!? What if I need something completely unique that you don’t already have?” Awesome! BuildFire was built for that very reason. If you need something unique, that can easily be built on top of our existing functionality. Rather than having to build everything from scratch and spending unnecessary development hours, you can get your app to market faster than you could otherwise. So if you need a feature that we don’t already have, we encourage you to visit this page where you can fill out a contact form and one of our App Specialists will be happy to discuss how we can build something great together! Additionally, if you’re a developer, you can create your own Marketplace Features (also known as plugins) and sell them to our worldwide customer base. Click here to learn more about our developer program. Now… let’s jump in and explore the BuildFire platform. First, we’ll talk about the App Dashboard because it’s primarily what you’ll use when you’re building and managing your app. What is the App Dashboard? 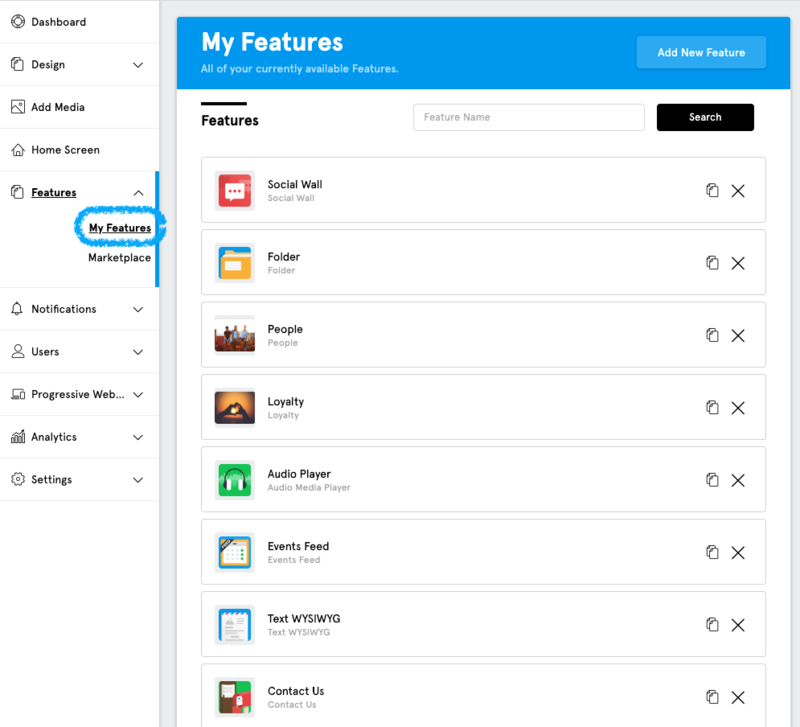 The App Dashboard is where you’ll manage all of your app’s content and features. The Menu is what you’ll see on the left hand side and is primarily how you access the system’s core features. The Feature Content Editor is what you’ll see in the middle and is what you’ll use to edit your app’s content. The Emulator is what you’ll see on the right hand side. 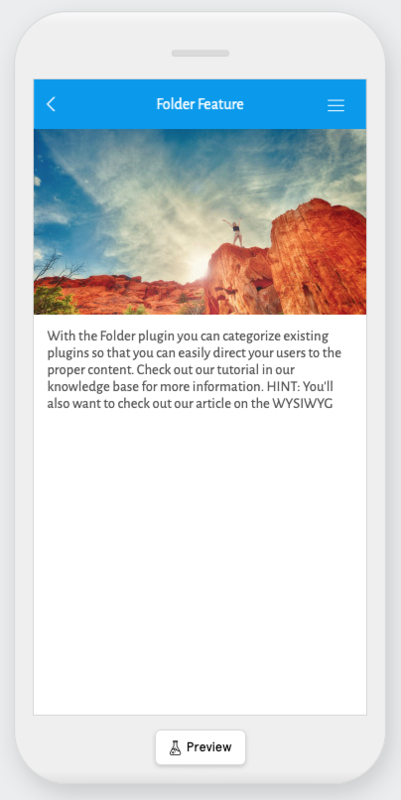 This will let you navigate to different Marketplace features you’ve added to your app by navigation throughout your app and will also give you a real time preview of what your app will look like as you make changes to its content and design. When you first created an account, you either started with a blank app, template, or you had our awesome Pro Services team design and construct your app for you. If you’re building the app yourself, the templates should provide you with a great starting point so that you can simply swap it out with your content and you’re app will be ready to launch. If you started with a blank app, not to worry you’re more daring than others! 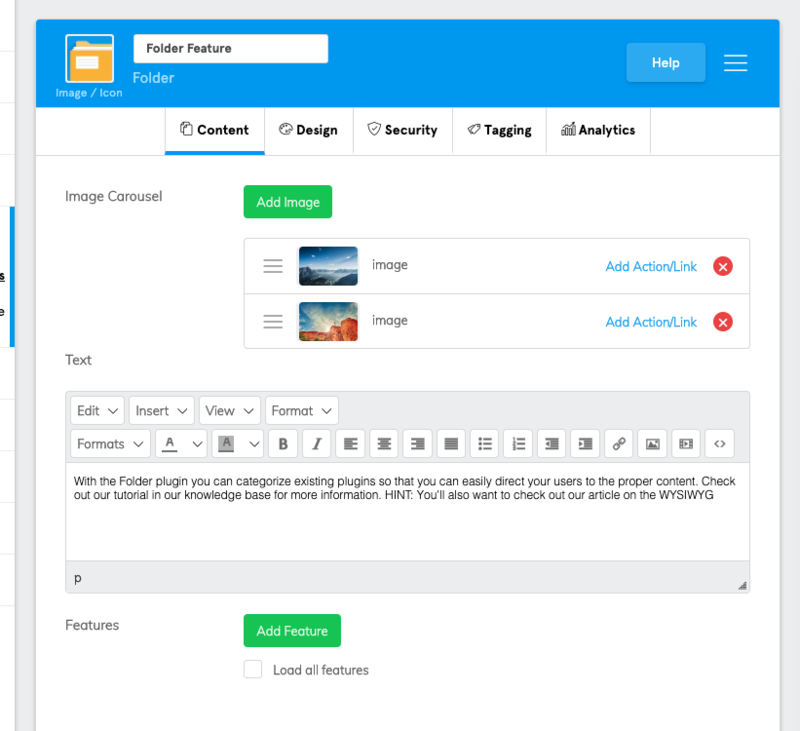 The template is simply a starting point for your app. You can create all templates from each other. They do not change the functionality of the app itself. If at any time you need to create a new app, simply go to the dropdown with your app name at the top of the App Dashboard and click “Create New App”. If you’d like our Pro Services team to either design your app or build completely custom features for it, click here to get in touch with them. Next we’ll go over what’s the difference between Core Features and Marketplace Features. As we go through these lessons you’ll see reference to two different types of features. Core features and Marketplace features. You’ll encounter both in the App Dashboard and you may be asking yourself, “What’s the difference between Core Features and Marketplace features?” Well we’re glad you asked! Note: Some advanced core features may require you to be on a specific subscription plan for you to use them. 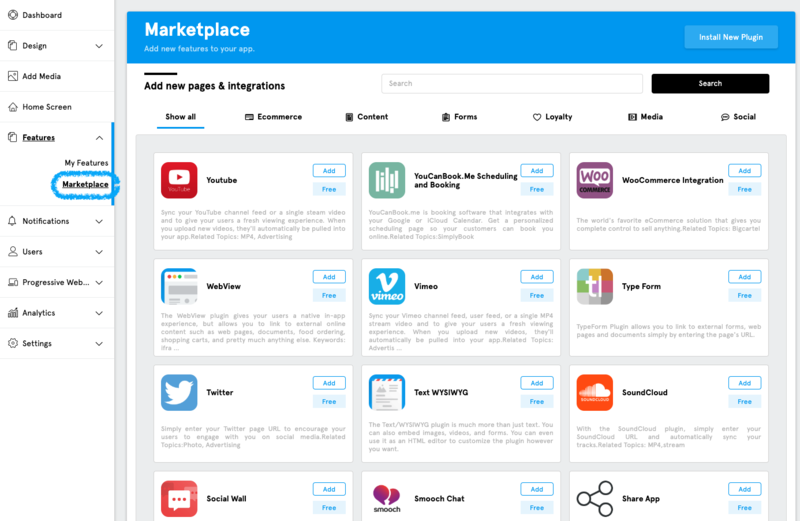 The vast majority of Marketplace features allow you to create multiple instances. What we mean by that is for example, if you have more than one calendar that you want to display in your app, you can create multiple Event instances. Or if you have multiple music albums or lecture collections, you can create multiple instances of the Media Center Manual Feature. Or if you have different categories for your blog, you can create multiple instances of Media Center RSS Feature. You can then categorize them within a Folder Feature or add them to your Side Menu to make them easily accessible. Existing feature instances can be accessed and edited by either clicking on them in the emulator on the right hand side of the App Dashboard or by going to Features -> My Features and then accessing it there. You can also create a new instance of a Marketplace Feature by going to Features -> Marketplace. Next we’ll go over how you can preview your app on your phone while you’re working on it. Previewing your app through our dashboard is pretty awesome and it’s really convenient when you can make changes in the App Dashboard and see those changes update in real time in the emulator. However, it’s not quite the same experience as checking out your app on the device it’s meant for — your phone! This will ask you to enter in your mobile phone number and within seconds a preview link will be texted to your phone! 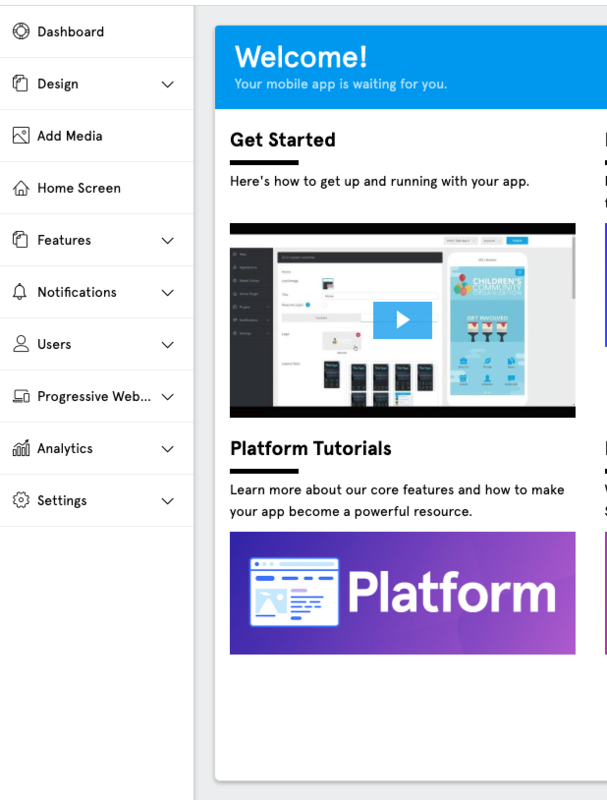 Now that you know what BuildFire is, what the App Dashboard is, what the differences between core and marketplace features are, and how to preview your app, in the next lesson we’ll explore the common system components that will help streamline your app building experience.